SQL Saturday Jacksonville #298–So you think MDX is hard? For SQL Saturday #298 in Jacksonville, FL on May 10, 2014 I am presenting “So you think MDX is hard?”. 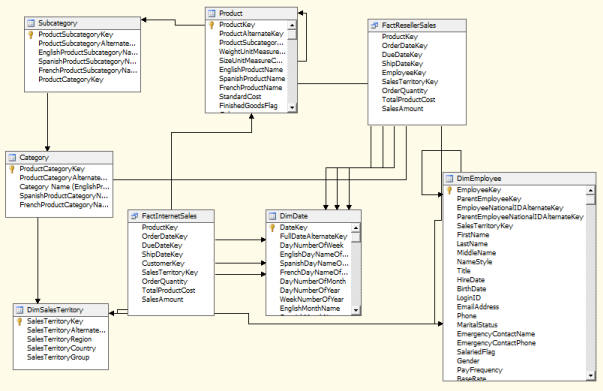 Anyone who works with SSAS (SQL Server Analysis Services) knows the DSV (Data Source View) is the key to the project. It is through the DSV that everything else is built on. Unfortunately, in most projects I’ve worked on, it is generally the biggest mess. Take this simple example cube based on the Adventure Works data warehouse. What a mess! Fortunately there is a very simple way to clean it up. Go up to the toolbar area. Right click to bring up a list of available toolbars, and pick the Layout. Hover your mouse over each item, you’ll see tool tips such as Left Alight, Right Alight, Align Tops, and more. Note that in the menus there is a menu named Format. The same items on the toolbar also appear in the menu. I find it a little easier to use the toolbar, but do what you are comfortable with. OK, now that we have our tools ready, we can start cleaning up that messy DSV. There are two ways to select the tables (or views) that we want fix up. First, you can simply click in an empty area of the design surface and drag the mouse. A little dotted line outline will appear showing you which tables will be in the selection. The other option is to click on the first table, what is known as the “reference”. You’ll know the reference because it has white border handles. 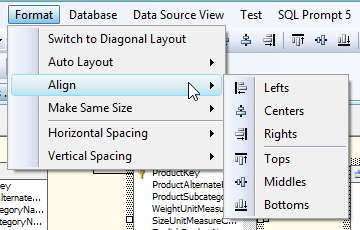 Then CTRL+Click on the other tables you wish to align, or make the same size as, the reference table. You’ll know these because they have a thick black square on the sides and border. With just a few minutes work your DSV is now organized into neat rows and columns of uniform width. This makes it much easier to read. Your eye is not distracted by the jagged alignment and the uneven widths. Instead, you can much more easily focus on the text inside the boxes, which is after all the important part. One last tip, if you wish to move the selected table (or tables) a bit, hold down the CTRL key, then use the arrows to move everything in tiny steps to the position you want. I did the above example using SQL Server 2008R2 BIDS, this technique also works with the SQL Server Data Tools that shipped with SQL Server 2012 (SSDT, aka Visual Studio 2010) and with the newer SSDT for Visual Studio 2012. I had a real head banger this afternoon and I’m not talking about the heavy metal playlist I was jamming to in my iPod. 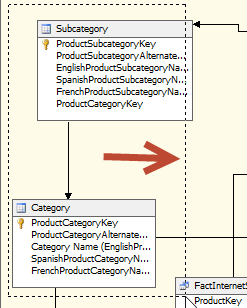 I had a dimension in SSAS where I had a Level1 -> Level2 Hierarchy built. 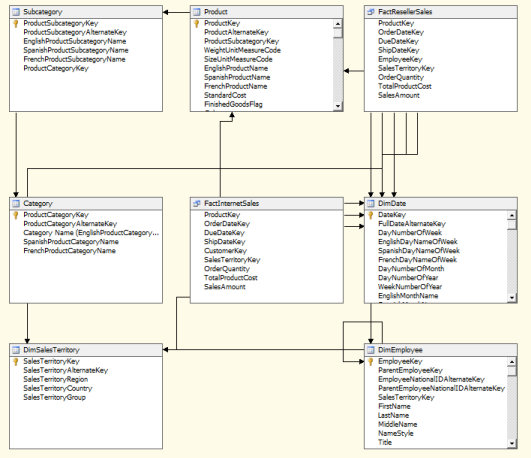 When I tried to process the dimension, SSAS kept kicking out “duplicate attribute error” on Perry. I did the usual checking, yes my attribute relationships were OK, the Key property was built correctly, etc. So then I moved to look at the data itself. I first did a SELECT * FROM CoolShow WHERE Level1 = ‘Phineas and Ferb’ and Level2 = ‘Perry’. I got back 4 rows. Hmm. After some more head banging (Guns ‘n Roses, Paradise City) I wound up doing a SELECT * FROM CoolShow WHERE Level1 = ‘Phineas and Ferb’ and I get back 42 rows with Perry. Hmm, I say to myself, “self, that looks odd”. To which self replied “duh”. Well obviously I needed a RTRIM, which I dutifully added then reran the query. Only to get the *Perry * again in the output. At this point self said I was on my own and abandoned me to drown its sorrows in a pitcher of margaritas. I took the output and copied it into an editor that would do hex mode. So what do I see but a 0D 0A in the space between the y and the *, causing me to scream “AH-HA” as Queen’s Bohemian Rhapsody hit its crescendo. I also scared the cat, but I only mention that because cute cat things are supposed to be popular on the internet and I figure it might help my SEO. For those who don’t speak HEX, 0D 0A is 13 and 10, which turn into a Carriage Return and Line Feed. So the moral of the story, if you get duplicates error, and your dimension looks okey-dokey, check the data to see if you have some errant CR/LFs. Apparently SSAS doesn’t handle them very well. Now if you’ll excuse me, I’m going to join self at the bar before self guzzles all the margaritas (self is such a drunken sot). AC/DC, take me away with some “Highway to Hell”! I’ve been asked to provide links to some useful resources for learning about SQL Server Analysis Services. Below are a list of my favorite blogs, books, and other sites to learn from. Microsoft SQL Server 2008 Analysis Services Step by Step – This is a great beginners book. If you are starting at ground zero, this is the book to start with. Professional Microsoft SQL Server Analysis Services 2008 with MDX – If you are looking for one book that has everything, this is it. It’s a huge book that covers pretty much everything you need to know about SSAS. Expert Cube Development with Microsoft SQL Server 2008 Analysis Services – There’s one book that is universally hailed as the “experts’” book, and this is it. Be warned, this is not a beginners book. Don’t try to tackle this until you’ve had at least a little SSAS experience. But it should definitely be on your “must buy” list at some point. 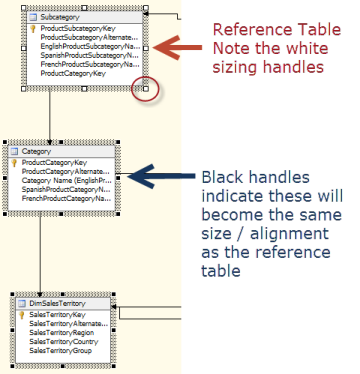 Devin Knight – My coworker Devin posts about all aspects of SQL Server BI, but his SSAS posts are ones I often refer back to, or refer others to, when learning SSAS concepts. Marco Russo – Marco’s blog is a great source of in depth SSAS content. He’s also one a co-author of the “Expect Cube. . .” book listed above. 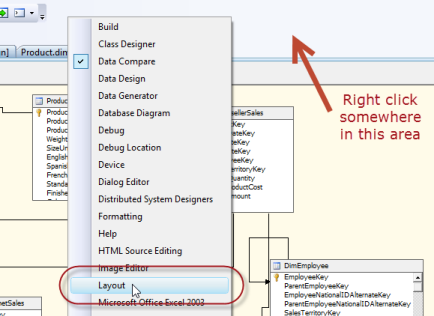 SSAS Info – This last link isn’t exactly a blog, but more like a blog aggregation site. It’s very useful though, and should be on your list of regularly read sites. Pragmatic Works Webinars – On our website we have a big catalog of past webinars (all of which are free to watch), many of which focus on SSIS. Pluralsight – Pluralsight has an extensive catalog of courses, including some great SSAS content by Stacia Misner. It’s subscription bases so there is a modest fee (starts at $29 US per month last I checked) but well worth it for the training you can get. There’s also a free trial. SQL Share – This site takes a new twist on videos, in that each video is very short and very focused on one specific task.